Imprisonment for Passing A Stopped School Bus in New York? Passing A Stopped School Bus in New York, also known as New York Vehicle and Traffic Law section 1174 (“VTL § 1174”), is one of the more serious violations a driver can be accused of and it can have hefty consequences if not handled correctly. The elements to this violation are found in VTL §§ 375(20) and 1174 and must be proven by the People before a driver be convicted of this violation. Passing A Stopped School Bus is among the more serious VTL violations because of its potential consequences. No only does this violation assess 5 points to the driving history of a New York State motorist who is convicted, but the fines are hefty. Depending on the number of previous Passing A Stopped School Bus convictions a motorist has, the fine assessed by a judge can range from $250 to $1,000. Or, at the Judge’s discretion, he or she may sentence the driver to imprisonment as part of the sentence. Imprisonment can range from up to 30 days to 180 days. Additionally, a driver may possibly face a license suspension. Conviction of VTL § 1174 can also trigger an automobile insurance increase that can cost thousands of dollars over a period of years. If that is not enough, the DMV can assess a fine to a driver which starts at $300.00. 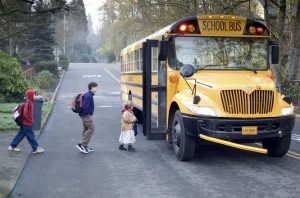 To sum up, being convicted of, or pleading guilty to Passing A Stopped School Bus can mean huge fines assessed by the court, possible imprisonment, thousands of dollars in automobile insurance increases, license suspension and a DMV assessment.